Our last episode in the series features Kate Roosevelt speaking with Erin Culbertson, Director of Development at Seattle Academy. Kate Roosevelt: Great to have you here, Erin. Today, we are going to explore campaign best practices through the lens of Seattle Academy’s SAAS Rising Campaign. We’re excited to hear about what you and your team have experienced and learned through your campaign process which is about five years going, right? Kate: Well, let’s jump in. I’d love to hear a little bit about a particularly challenging moment in your campaign, and what was the lesson learned? Erin: I think a really challenging moment was actually getting started. You were our campaign counsel for the campaign, and I joined the team in the early phase. We had been in the feasibility study phase, we had been in the task force phase, and now we were in the asking phase and transitioning into do the work, get out there, talk to the families, talk to the potential donors. And that idea of balancing thinking, and planning, and executing was initially a challenge. We had over 20 volunteers on our first campaign committee. Kate: And lessons learned from that in terms of what your colleagues in the independent school sector and the development sector more broadly could learn from that? And I think once we were on the same page—"we" meaning me, staff, leadership, the leadership of the campaign, with the broader volunteer team—that’s when we could really launch. And so there was this period of several months where the process was really getting everyone on that page. Kate: The goal that you set out to achieve of raising $35 million to transform your urban campus was way beyond what the school had ever raised in the past. I know that there had been at least two prior campaigns, so there was a history of success. Talk a little bit about what support and resources were most helpful to you and the rest of the team during the SAAS Rising Campaign. Erin: My gut instinct is the leadership of the school was key. So, the Head of School, the Associate Head of School were 100 percent on board. As was the Board and our Board leadership, and so when I started, they were prepared to put the resources together so that we could achieve such a huge idea. Obviously campaign counsel—I really do think that was huge, that we had counsel. The feasibility study was huge in engaging some of our early supporters, in understanding the landscape we were facing, and jumping into an enormous goal. We still pushed the limits of that goal, relative to what the feasibility study said. But we made that choice as educated as we could be, and I think that was huge. And then I have this really strong executive team, and we met every two weeks. So I can’t imagine having done what we did with less support, with less commitment, from that particular group of individuals. Kate: You’ve already touched on a whole host of best practices that are essential for guiding successful campaigns like yours. 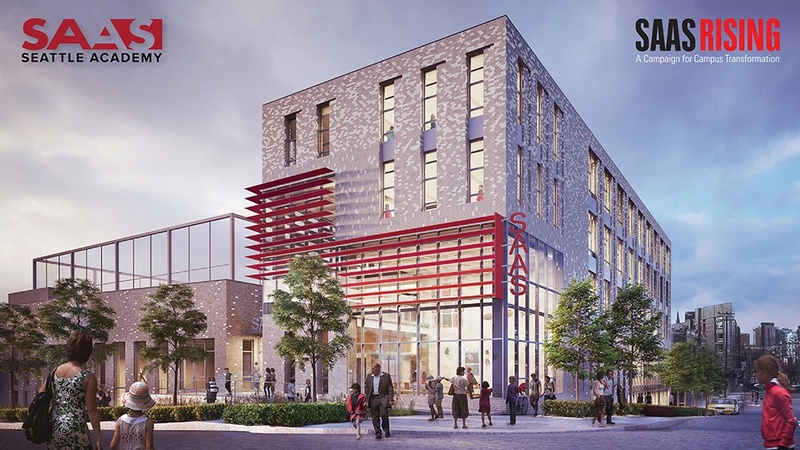 What best practices do you think Seattle Academy succeeded in implementing, either before or throughout the campaign? Erin: Early on in my tenure, we had the opportunity to create a position that we called Campaign Coordinator. And that person worked really closely with me. She was able to do things that included prospect research, prioritizing prospects and next steps, really being in the data as both data entry as well as analysis. And that kept us on track. 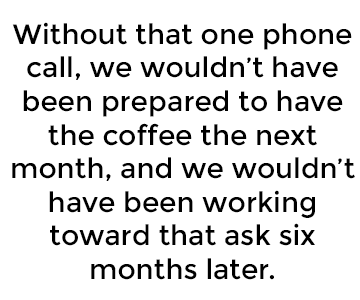 Yes, there’s this grand vision for the campaign, but “you eat that elephant one bite at a time.” And our “one bite” that we implemented was this campaign coordinator sending out those notes and making sure that that one phone call that needed to happen happened in that two-week span. Kate: Have the culture around the discipline of the meetings and also create systems around accountability. Erin: That word discipline really struck me—I think it’s a great word to describe what we did. And I think that for volunteers in particular, you know there’s so much of an intellectual and emotional energy of carrying the administrative work. I think the fact that we were dedicated to taking on as much of that for our volunteers as we could, so that they could excel in the place that we couldn’t. We aren’t the peer, neighbor of that seven-figure prospect—they are. So we really tried to maximize those volunteers in doing the thing that they could do for us that we could not do for ourselves. Kate: Erin, you joined Seattle Academy in 2013. When you think back on the last four and a half years, what makes you most proud? We were asking ourselves that question a lot to make sure that we were expressing this authentic need that we as an organization had. “If you help us, with your help, we can bring this vision to life,” and it resonated with the donors when we were so clear about what our need was. And together we have accomplished something that no one of us, no one donor, no one Head of School, no one Development Director could have achieved on our own. And I think the campaign will leave a legacy of a system as well. Kate: I’d love to hear you talk about some of the ways that you and your colleagues stepped back to analyze where you were and determine what was needed to refresh the campaign strategy. Erin: We really did step back and look, I would say, every year. I’m thinking back right now in my mind to our summer board retreats and the fact that I made a presentation—we did it together, basically every year. And that was always a really great time to take stock of where we were and think forward to the next year of work and look at, what volunteers do we need for next year? What tasks do we need them to do? Who are our prospects? In the last phase of our campaign, we really had asked pretty much everyone in our community, so a lot of our prospects were going to be people very new to us. And so our techniques and tactics needed to shift for this final phase. We had something that we called the “fall 40” one fall, and it was actually about making 40 asks. It wasn’t even about gifts, because the making of the asks was something the volunteers could fully control, so we really wanted to motivate them to do what they could do. Were 40 asks going to get us to $35 million? Not all the way, but it was going to take that next bite out of what we needed to do! Kate: Tell us a little bit more about the strategies that you and your colleagues used to engage your rock star volunteers and staff, not just early in the campaign, but throughout the campaign. What can we learn from that? 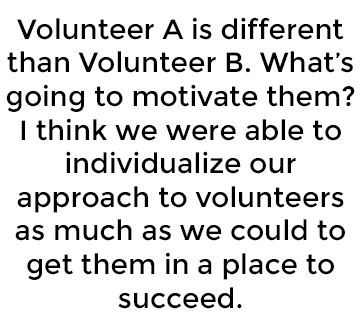 But Volunteer A is different than Volunteer B. What’s going to motivate them? I think we were able to individualize our approach to volunteers as much as we could to get them in a place to succeed.